ProlificPanda, Butterface23, hailong88, msting, Jurka, usually3, decker and 7 Guests are viewing this topic. In for hopefully 1 aluminum and 1 PC! I accidentally submitted two responses for PC form (lost track of the first one, and wasn't sure if I had hit submit on PC the night before). Please keep line 186, remove line 251. Thanks! Please let's do that during order change window. In case you are sent 2 invoices just pay one of them. Is this all the same on pc, alu and brass? Dear all: Thanks for all the DMs and PMs. Invoices for PC and Alu have not been issued yet, and they will be sent out after order check has completed. So far we are looking at 150 paid orders from China, excluding full brass, leaving a possible 500 slots for the rest of the world. In the international GB, we are looking at roughly 370 submissions without deleting possible duplicates. Once the rest of the slots are filled or when 4/30 comes (whichever first), we will start order check for 2 days and send out invoices to all. Hope this is clear! Thanks for all the support. We have started material procurement for both brass, PC, and Alu, in preparation for production. Yes they are all there, with one difference being that on black pc, alu, and brass, the 14 rgb underglows will have no effects as they are under the pcb. 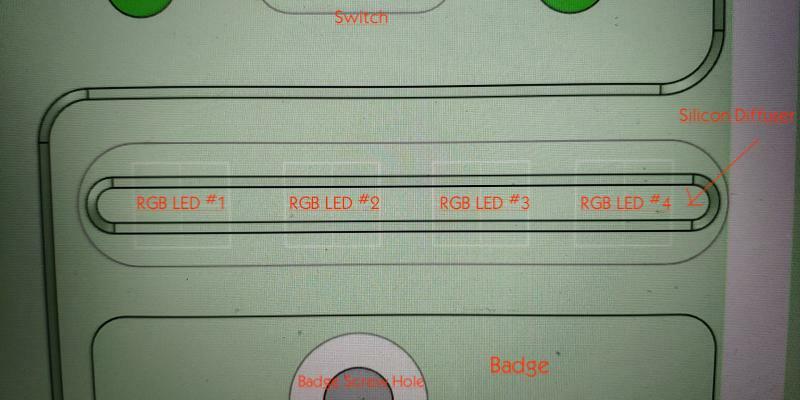 4XRGB and 3 RGB LEDs will always work, please see the demo here for alu version. Just getting into the hobby from lurking for a while and this will be my first GB. Very excited and looking forward to the final product. Really appreciate the detailed info and communication throughout this process. Some asked about the diffuser in the discord, I figure it is worth more explanations, as it will be very dope. Here is the updated model with 4 RGB LEDs above badge under the silicon diffuser, hope the model is clear enough. Thanks for all the suggestions. just got in for a waves green alu apart from my PC. What color will the alu prototype be ? Any chance of seeing a render of nautilus nightmares along with the waves green board ? What would be the best way to mod this board to get RBG lighting diffused in the top case too? The kaihua socket hotswap PCB included in this are compatible with any switches? Which type? PCB or plate mount? In for frosted PC and Wavez aluminum. So hyped! 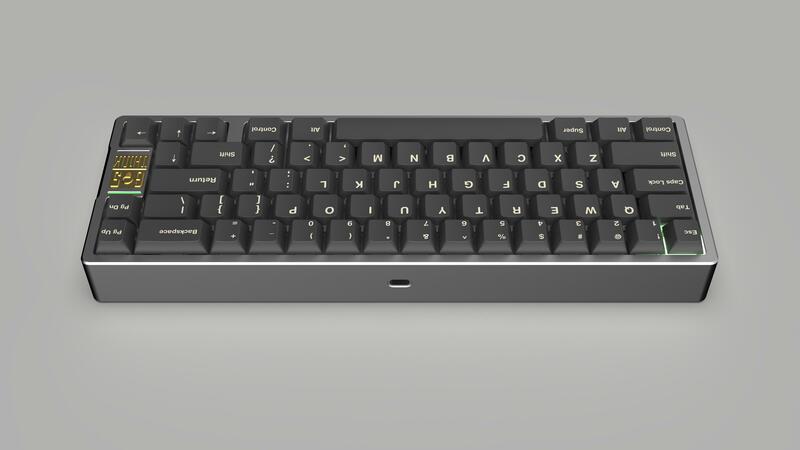 Yes, the hotswap PCB will work for any MX style switch (Zealios, kaihl, Gateron, cherry etc). This one is compatible with both plate and pcb mount switches. In general though, pcb mount switches can be used with any pcb. If the pcb is plate mount only, you just need to cut a couple of the plastic legs on the bottom off, it's a really easy fix. 1st) if i order pc und alu - its just 1 shipment cost? 2nd) what kind of stabilizers do i need for the boards - is i‘m a noob i would take hot swap boards, but i think i have to install stabs. 3rd) wanted 1 badge and 2 non badge version, i understand this is just gold ? Wavez alu is not green ? Do i get the extra badge as a paper weight with non-badge board ? We will get a few Alu prototype out next week, including wavez green. X 1 Frosted PC here! One shipping, based on weight of the total package. Hmm, I am a bit confused by the first question. Wavez Green is a dark green. Somewhere between the Wavez mod and Wavez Alpha. Again I do not understand your third question. So you are getting 3 total Think6.5s? 3rd) i understand this is just gold ? 3rd) Wavez alu is not green ? 3rd) Do i get the extra badge as a paper weight with non-badge board ? Ah, one more question ... with badge version, i have to solder the leds above badge, or are they pre-soldered ? Thanks for your reply, very clear! I have another question regardding shipping. I'd probably choose SF Express as a shipping method to Italy, being cheaper. Does somebody (most likely oldcat) know if it is possible to get the shipping delivered at the post office (any in my city would be fine), then I'd go to pick it up? I'm not sure which local postal service will handle the shipping locally, so this is kinda of my doubt at the moment. Do you think DHL, on the contrary, being an international courier, offers this service in case SF Express doesn't? This is the form of all eligible orders without deleting potential duplicated orders. if you double ordered, please wait till order change period to request cancellation and let us know which one you keep. Potter's corporate PayPal account registered with his company has been approved. And we will try to do bulk invoicing for PC/Alu. I'm not on the list! Was my entry not eligible somehow? I originally thought it was at 6:30AM instead of PM, so I submitted one in the morning, but then I submitted another one in the evening at like 6:50PM. These are the two who submitted 30 seconds too early, are you one of them maybe? I was a bit disappointed after I was positive that I entered my form in time, only to not see it on the confirmed list, as I knew I wasn't going to get a great raffle spot if I entered again days later. Well, I did enter again yesterday, and my name is still not on the updated list! This time I'm 100% positive my form was submitted and was valid. Any idea what's going on here? Perhaps a sorting error. Let me take a closer look. I think it is because when you looked at it, I was sorting how many orders there are for each layout We get you covered, don't worry buddy. What is the zip code from where you ship and what is the estimate for weight and size of the package? the rest of the brass invoices are being sent, please check your email box for the invoice and we appreciate if full brass invoices can be paid promptly. Aluminum/PC invoices will come later, after order check. When is the window time for pc order change? I would like to update my order. Thanks. For default, it is 18K gold plated PVD. It cannot be modified. Didn't see myself in the list so I put in an order again. Sorry brother the list was up to date till yesterday. Thanks for the support! Currently we are approaching the quantity limit, so it could come sooner than 4/30. My plan was still to show you guys how alu looks and how alu+pc would look like IRL, as more PC and alu prototypes will be shipped to me imminently. Plan for 5/1-5/2 for order change (I will send a free form for you to write how you want to change/combine/cancel), and 5/3 invoice will go out in a batch. Page created in 0.19 seconds with 78 queries.